Wasatch Academy’s Sheilah Cheruiyot represented the Tigers well at the BYU invitational and the region championships, winning one race in region. PROVO—Sanpete track and field teams saw several of their own bring home top honors for their efforts at both the 3A/2A region championships, as well as the BYU Invitational in Provo last week. At the BYU meet, Manti’s Madison Norris took fifth place in the girls’ 1600-meter finals and third place in the 800-meter finals. Manti’s Jordan Cheney took sixth in the boys’ 1600. Manti’s relay teams placed sixth in both the boys’ and girls’ 4×100-meter finals. Manti girls took third in the sprint relay finals, while Manti boys took fourth in the same event and also claimed third place in the 4×400-meter relay. Gunnison’s Kate Sorensen won the 100-meter dash final and the 300-meter dash final. She also took third in the 200-meter dash final. Overall, Manti finished eighth as a boys team and sixth as a girls team, while Gunnison girls team finished tied for eighth. Manti boys edged out Emery by 10 points to take first place in region with a combined score of 109, led by first place finishes in the 4×400-meter relay, the long jump, and the javelin. Templars Jarod Durtschi and Andrew Valentine claimed the respective honors. While Manti girls didn’t quite get the top finish, they came home with the bronze as they sported the top finishers in the 1,600-meter run, the 4×400-meter relay, and the sprint medley relay. Templar Madison Norris took the top spot in the 1600. Gunnison, as a team, finished fifth in region standings, but saw sensational performance from some of their top athletes. Lady Bulldog Kate Sorensen, widely considered one of the best hurdlers in Utah, easily claimed the top finish in the 100-meter and 30-meter hurdles, while Jade Wimmer placed first in the 400 meters. Gunnison boys finished in sixth place overall. 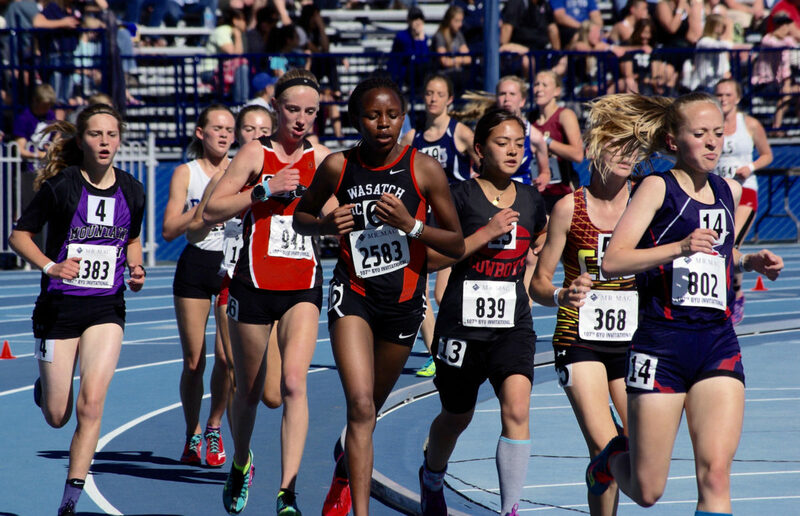 Wasatch Academy struggled as a team, finishing last in boys and girls standings, but Sheilah Cheruiyot well represented the Tigers by taking the top spot in the 1,600 meter run. In 3A, North Sanpete also fell to a last-place finish in Region 12 in both standings, yet Hawk sprinter Parker Hightower wouldn’t be denied his day in the spotlight, winning the 100 and 300-meter dashes. State championships are around the corner. BYU Track and Field will host both the 2A and 3A state championships this weekend, May 19-20, in Provo, with events held all day. Players and coaches on the Gunnison Bulldogs baseball team stretch out their hands toward their trophy after winning their first state championship since 2012. 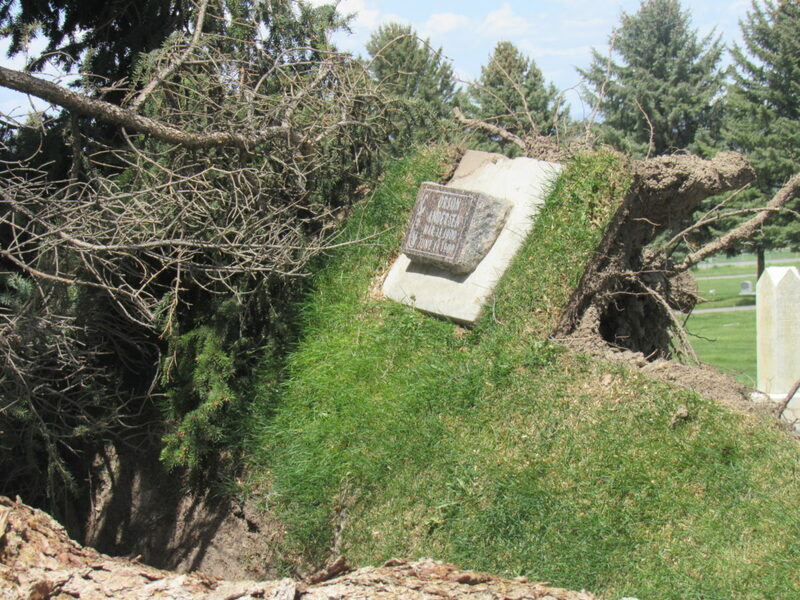 Winds gusting over 75 mph on Saturday ripped down four century-old trees in Manti City Cemetery. While the falling trees also upended some gravestones, Kent Barton, Manti City administrator, says damage wasn’t serious. City workers are working to repair the damage before Memorial Day. An older home that formerly housed a Utah Heritage Credit Union loan office was torn down last week to make way for a new Ephraim Branch building (inset). After the new building is complete and the staff has moved in, a second older home, which currently houses credit union tellers, will be torn down for a parking lot. 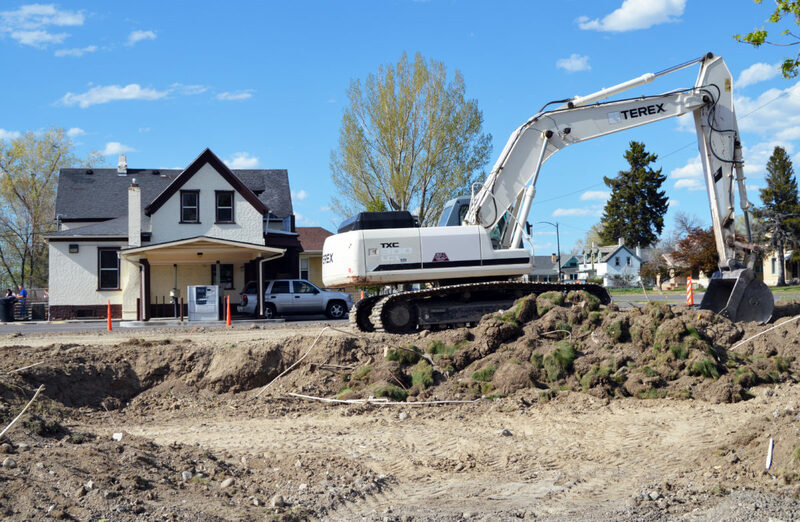 EPHRAIM—Utah Heritage Credit Union has started on a project that will culminate in a new building on Main Street in Ephraim. “It’s something Utah Heritage has been looking forward to for many years,” said Donald Watson, CEO of the credit union. The credit union started planning for the new building and setting aside funding before Ilene Rollo, long-time CEO, retired in 2013, Watson said. Members of the board include Susan Larsen (Ephraim), Jeff Anderson (Manti), Claude Pickett (Ephraim), Cody Beck (Mt. Pleasant) and Branch Cox (Fairview). Final steps toward the new building began last fall when the credit union hired Kevin Madsen and Associates of Provo, the same architectural firm that designed the new Fairview City Hall and Cleone Eccles Library. The Ephraim branch has been housed in two older homes. The home on the south has housed the loan department while the one on the north has housed member services, including tellers. Most of the loan staff has moved to the north building. Last week, the south building was demolished. The new building will be built on the south end of the property where the south house was demolished. Once the new building is finished, Watson said, all Ephraim staff will move in. Then the north building will be demolished and a parking lot completed in its place. The branch will remain open throughout construction. The general contractor is Landmark Construction of Logan, but Todd Alder of Ephraim, owner of Todd Alder Construction, will be the construction superintendent, and most of the subcontractors will be from Sanpete County. According to Watson, the new building will have 3,840 square feet on the ground level, with 2,990 square feet in the basement. The basement won’t be occupied at first but will be available for expansion. 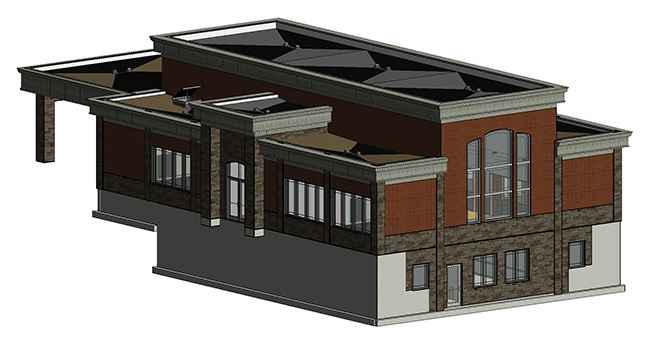 The building exterior will be a mix of stucco, brick and stone. The main entrances will be on the north and south sides of the building. A three-lane drive-through will be at the rear of the building. Perhaps the dominant feature will be arched windows on the Main Street frontage of the building. The windows will extend from near ground level almost to the top of the structure. Inside, the new building will have five offices and four teller stations, including two stations able to serve drive-through customers. “It will offer all the services of a full-service financial institution” under one roof, everything from mortgage and construction loans, small business and agriculture loans, to loans for new and used autos, ATVs, Watson said. Other services will include recreational, personal and credit card loans; savings, checking, IRAs and CDs. The credit union CEO said his organization “did everything physically possible” to maintain the older homes. But both were deteriorating. “Both homes, got to where the foundations were crumbling and major roof repair was needed,” he said. “We’re excited to be able to add a new building to the Ephraim Main Street,” Sterner said. The credit union started in 1969 with 23 members and headquarters in Moroni. It was called Moroni Feed Credit Union and primarily served employees of Moroni Feed Co.
Its first branch was the Ephraim Branch, which opened in 1999. The Gunnison Branch opened in 2004 and the Mt. Pleasant Branch in 2008. In 2009, the operation changed its name to Utah Heritage Credit Union, reflecting the fact that it had become a community-based credit union serving a much broader population than Moroni Feed employees. Today, it has 7,800 members and $63 million in assets. “We’d just like to thank the local members for their support over 48 years to enable us to grow in this community,” Watson said. This artist’s rendering is what the new Utah Heritage Credit Union building will look like once completed. The bottom floor is a sub-ground level basement. MANTI — With the sentencing of Angela Atwood on last Wednesday May 3 in Manti District Court, the Fullwood murder case has been resolved. Judge Marvin Bagley sentenced Atwood to as much as 15 years in a Utah prison, after she finishes a sentence of at least six years in a Nevada prison. Charlotte Stewart, daughter of Leroy and Dorothy Fullwood, who spoke at the Damian Flores sentencing, addressed the judge about Atwood’s role in the crime. Atwood told the judge that when she committed her crime, she was on drugs. “I was high, on drugs, I was selfish.” She said that she didn’t know that a murder had been committed until she saw it on the news. After she was taken into custody, she said, she tried to cooperate with the authorities as soon as she could. Judge Marvin Bagley was not convinced, however, and sentenced Atwood to serve prison in Utah, after finishing her term in Nevada. Atwood was found guilty of burglary of a dwelling, a second-degree felony and attempted aggravated burglary, a third-degree felony. She was sentenced to 1-15 years in prison for the second-degree felony and 0-5 years in prison for the third-degree felony. The two sentences are to be served concurrently but consecutive to the term in Nevada. Signe Gines, 53, an Ephraim native and cancer survivor, is hiking from Canada to Mexico to raise money for cancer research. 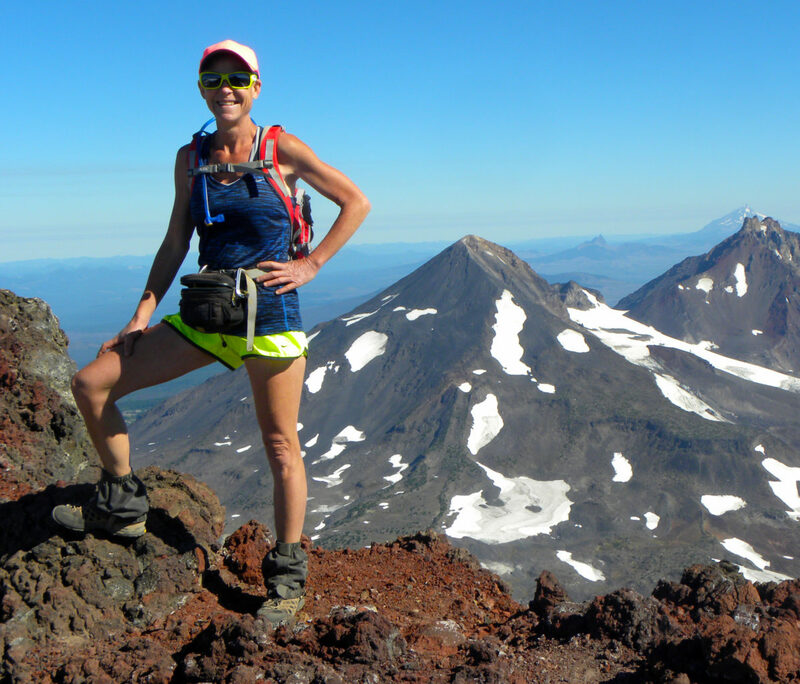 She embarks on June 1 and says the solo trek will be 2,650 miles and take nearly four months. MANTI— Manti chose its new queen, Breanna Hedelius, during a pageant last Friday May 5 at Manti High School. The new Miss Manti is the daughter of Eric and Marilyn Hedelius. She performed the piano solo “Hungarian Opus. 39, No. 12” by Edward MacDowell. 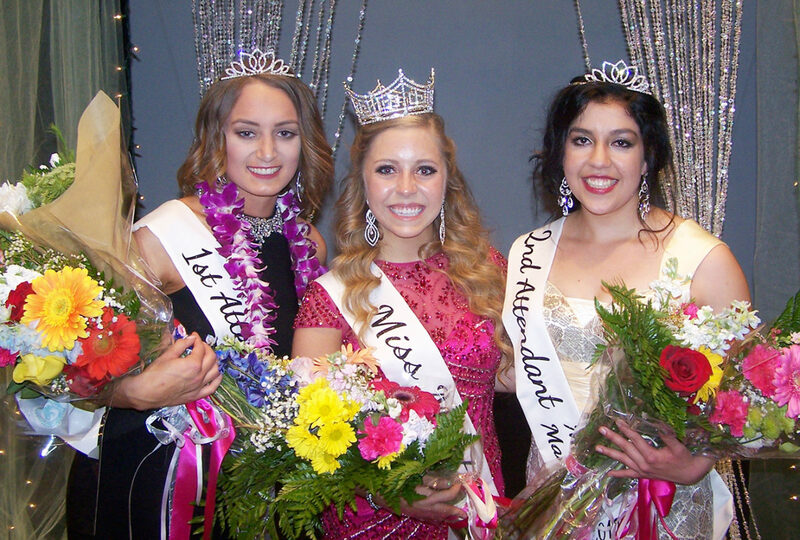 The first attendant will be Jenessa King, daughter of Robert and Shari King, while Jasmine Alcala, daughter of Martin and Clair Ann Alcala, was crowned second attendant. Amber Naylor, daughter of Mike and Alisha Trainer, was named Miss Congeniality. MANTI—The man at the center of an eight-hour standoff with police last month in Fairview seemed more ready to put to an end the court case arising from the incident. In a quick resolution to the headline-drawing case, William Davis Lamb, 31, of Mt. Pleasant, pleaded guilty to seven criminal charges in Sixth District Court in Manti on Wednesday, April 26, just nine days after the standoff. Some of those charges, however, were from another case that was already active. In return for his guilty pleas in those cases, a third case was dismissed completely. Lamb garnered attention on April 17, when he instituted a stand-off with police that ended only when police K9 units entered the residence he had holed himself up in, negotiations and teargas grenades having failed to resolve the incident before that. Lamb had invaded the Fairview residence of a former girlfriend, Aspen Lightfoot, and her children, though they evaded Lamb and escaped the home. The woman had a protective order against Lamb. Violating that order constituted a class A misdemeanor that Lamb pleaded guilty to. It was the second time in less than a month he had violated the order. He had approached Lightfoot on April 4, also. He pleaded guilty to that charge last week as well. According to Sanpete Deputy County Attorney Kevin Daniels, during the April 17 incident, Lamb made multiple threats against Lightfoot and her children. Daniels said that Lamb threatened to “mess up her face so bad that no one would recognize her,” and that Lamb had hidden guns so that he could shoot her sons. In the incident on April 4, Daniels explained that police responded to a domestic violence call, and found Lamb at Lightfoot’s residence with a .45-caliber handgun holstered on his hip. Because of the protective order against him, he was forbidden from possessing any firearms. The police also found that Lamb had struck Lightfoot on the face. In all, lamb pleaded guilty to violating the protective order (two counts); possession of a weapon by a restricted person, a third-degree felony; and assault, domestic violence in the presence of a child, threat of violence, and interruption of a communication device, all class B misdemeanors. Three misdemeanor drug and assault charges, and one felony drug charge, were all dismissed as part of the plea arrangement. Sentencing is scheduled for June 7 in Manti. Gunnison Valley Bulldog pitcher Parx Bartholomew sends a strike towards the plate in the Bulldogs’ 25-7 victory against Rockwell on Saturday. Bartholomew also contributed a double to the winning game. Manti shortstop, Lexie Alder, makes the tag for an out as Madison Cox moves into backup position. MANTI—The lady Templar softball team took on a hard-hitting Taylorsville team last Tuesday as they prepared for state tournament play, which begins today. The Warriors are a solid 5A team and used the long ball to pull away from Manti and earn the 17-8 win. The Templars looked relaxed and poised in the early going and held a 4-2 lead at the bottom of the first inning. A grand slam homer by the Warriors gave them the lead in the second and the Templars trailed 17-5 going into the bottom of the sixth. Six straight base hits by Manti brought three runners home to narrow the Taylorsville lead to nine and avoid the mercy rule win. The warriors had three doubles and five home runs in the game. Marquel Justice had the only extra base hit for Manti, a two RBI double in the first inning. Manti will now go into the state tournament as the second place team from the 2A Central Region. The first playoff game for the Templars will be at 1:15 today at the Spanish Fork softball complex, 295 West Volunteer Drive. Manti’s opponent for that game will be Kanab, the number three team from 2A South. The Lady Cowboys are 5-5 in region play and 10-10 on the year. Manti is 10-2 in region competition and 12-9 overall. The only common opponent between these teams is Delta. Both teams played the Rabbits early in the year with Manti winning 21-3 and Delta beating the Cowboys 12-13. The winner of this first round game will advance to play the winner of the game between Gunnison and either St. Joseph or North Summit. Losers of these two games will drop into the one loss bracket and face off in a do or die game to stay alive in the tournament. The double elimination tournament will continue tomorrow with the championship being played on Saturday. Going into the tournament, Enterprise is ranked number one, followed by Manti, South Summit, Beaver and South Sevier. Jorge Lemus advances the ball against Rowland Hall in the Templar’s first round win. Lemus had the only goal in the later loss to American Leadership Academy that ended Manti’s soccer season. 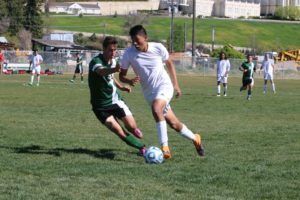 MANTI—The Manti soccer team opened state tournament play with a hard-fought 2-1 win over Rowland Hall and then lost to American Leadership Academy (ALA) in a shootout on Saturday to be eliminated from the tournament. Playing the Winged Lions, the fourth place team from 2A North, the Templars found themselves competing against a team that was a match for their speed and intensity. Rowland Hall drew first blood early in the game and led 1-0 at the half, but Daniel Frutos found the back of the net twice in the second half to give Manti the one-point win. The victory set up a second round match against ALA on the Manti home field. Strong and gusty winds complicated play throughout the game, but Manti took the early lead on a Jorge Lemus goal to go ahead 1-0 at the half. ALA matched that goal in the second to force overtime. After two scoreless overtime periods, the game was decided in a shootout. Each team would have five opportunities to send a player for a free kick against their opponent’s goalie. With the wind gusting strong enough that there needed to be a wedge placed in front of the ball to prevent it rolling off the free kick mark, the kickers had the advantage of wind assisted speed on their shots. Both teams converted on their first two attempts, but Manti’s third went wide left and fourth was high. ALA scored on their third and fourth shots to take the win and put an end to Manti’s soccer season. 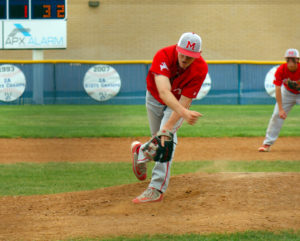 Manti Templar Adam Huff pitches against opposing Enterprise during the final inning of their first-round matchup on Saturday. Manti lost that game 12-1, but came back afterwards with a stunning 10-0 shutout win over Rockwell later that day. GUNNISON—The Manti baseball team opened state tournament competition last Saturday with their first round matchup against Enterprise hosted on the Gunnison baseball diamond. The Wolves pulled off the mild upset with a 12-1 win over the Templars, setting up a second game against Rockwell Academy. The Templars had no problem defeating the Marshalls 10-0 to stay alive in the tournament and advance to the next round that will take place today. 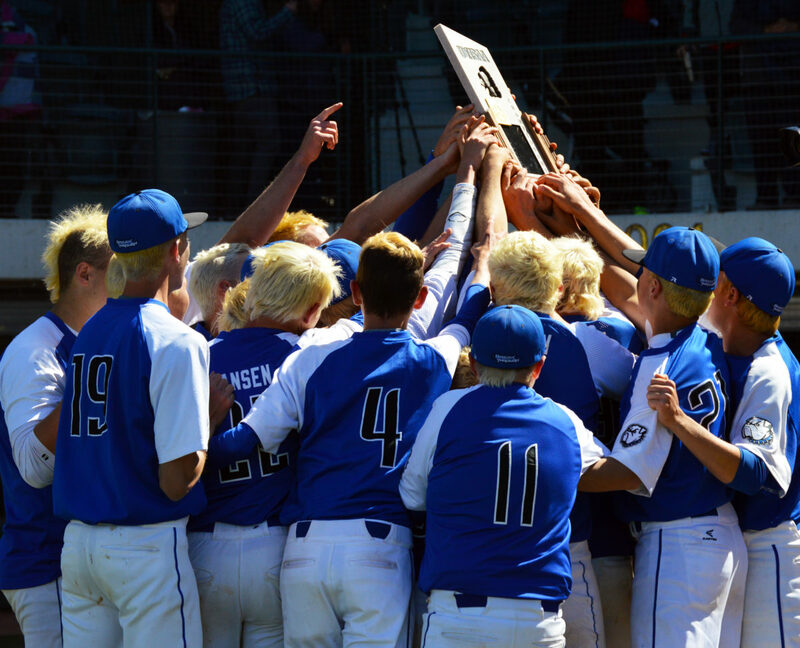 Last week, Manti coach Jim Nelson commented that the Enterprise Wolves were a good hitting team. “They can flat out hit,” he said. The Wolves proved that point in their win over Manti. They scored 12 runs on 13 hits, including a trio of doubles and a pair of home runs. The score was still close after three innings with Manti trailing 4-1, but Enterprise opened the game up with eight runs in the top of the fourth. Enterprise pitcher, Kaden Simkins, made a living on the outside corner of the plate, holding Manti to one run on six hits. Jaden Cox hit a double for the Templars. Manti then took on Rockwell, a team that featured only nine players, two of whom had never played baseball at any level prior to this year. The Marshalls lost their earlier game to Gunnison 25-7 in five innings. Things didn’t go much better for Rockwell against the Templars. Manti got on the board in the first inning on an RBI double by Darron McClain that brought Jace Miller home. Manti scored six runs in the first, added another in the third and then had the opportunity to end the game early in the bottom of the fifth. Manti needed three runs to invoke the mercy rule. An RBI single by Miller scored Marshall Dotson and then, with runners on first and second, McClain connected on a sizzling line drive that brought Jayden Cox and Tristan Barnes home to end the game. McClain went the distance from the pitcher’s mound and had two doubles. Cox joined Matt Nelson and Trever Trythall with a double each. The win over Rockwell keeps Manti’s playoff run alive and sets up their next game at Salt Lake Community College today. Manti will play at 1:30 p.m. and will have a chance to redeem themselves of their earlier loss to Enterprise. 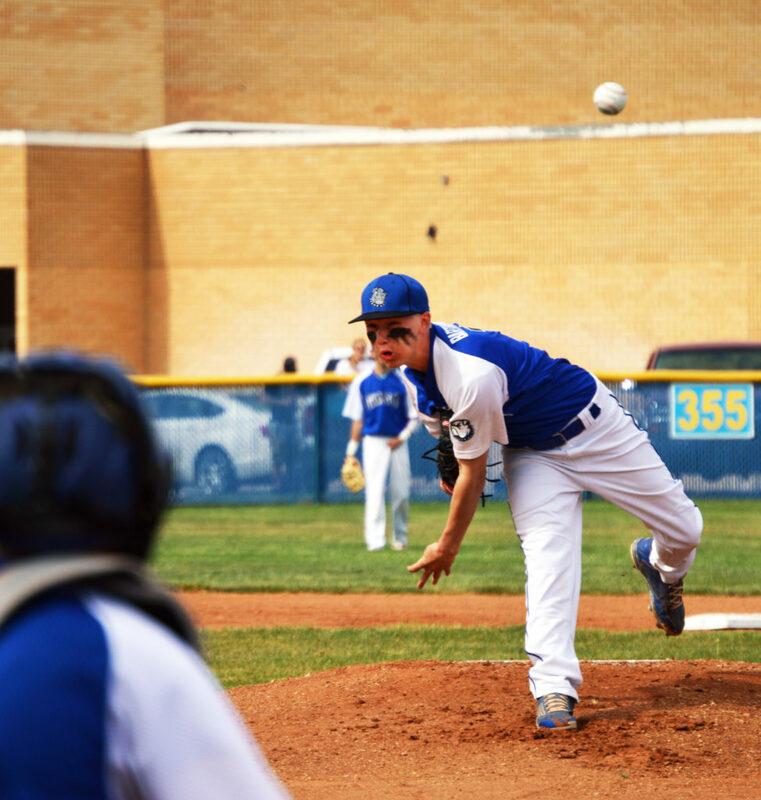 The Wolves lost their second game last Saturday to Gunnison 2-0. Today’s game will be do or die for both teams. The winner will advance to play at 7 p.m. against the winner of the Providence Hall/San Juan game. The loser will go home. Abby Cox and Lt. Gov. 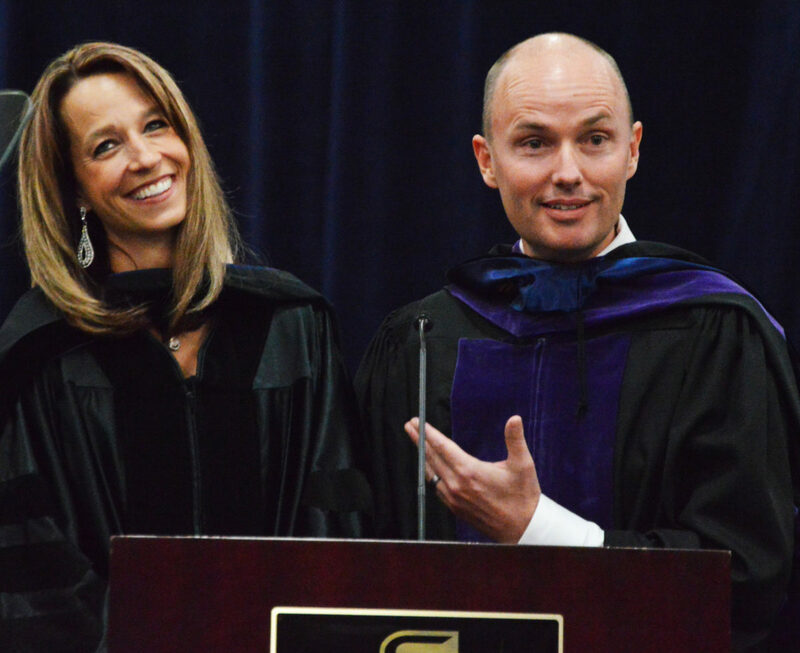 Spencer Cox deliver a joint commencement address to graduates during Snow College commencement last week. Current staff of the Sanpete Messenger celebrate awards received for work published during 2016. The awards were presented at the Utah Press Association Better Newspaper Contest banquet on Saturday, April 29 at the Utah Valley Convention Center in Provo. Pictured are: (seated) Karen Christensen, Suzanne Dean, Robert Stevens, (standing) Daniela Vazquez, Kyler Daybell, Bryan Spencer, Linda Peterson, Michael Bahlmann, Bob Bahlmann, Cathi Call and John Hales. 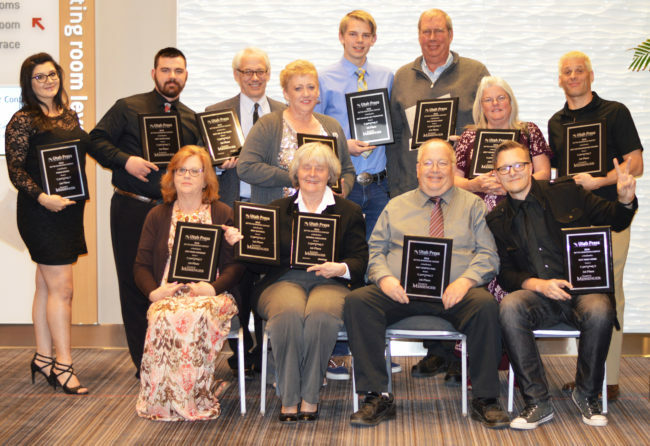 PROVO—It may have been a little while, but what used to be a regular occurrence has returned: The Sanpete Messenger is once again the best little newspaper in the state, as judged by fellow journalists. At a banquet and awards ceremony at the Utah Valley Convention Center in Provo on Saturday, April 29, the Messenger received the Utah Press Association (UPA) General Excellence award for newspapers with circulations of up to 2,500 copies per week. 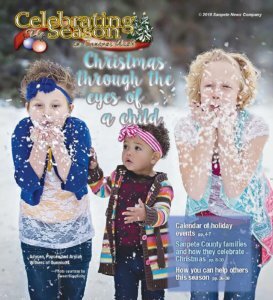 In the competition, known as the Better Newspaper Contest, newspapers are judged in various categories of news content, photography, design and page layout, and advertising. The judges this year were from Nevada newspapers. Of 26 individual categories, the Messenger placed first, second or third in 21 of them; 11 of the wins were first-place awards. The Messenger was almost a perennial winner of the General Excellence award throughout the first decade of the 2000s. But after about 2013, the Messenger went through what in sports jargon would be called a “rebuilding” phase. “About three years ago, we started having some long-time staff people leave us. We were kind of like a sports team with all freshman players,” Dean said. But a winning team has again emerged. 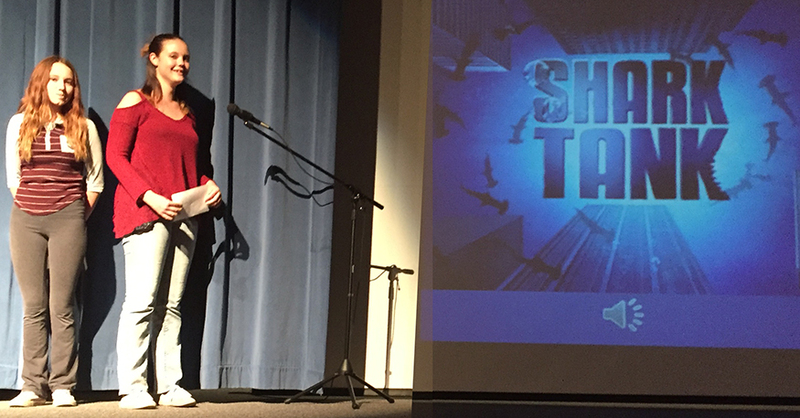 Publisher Suzanne Dean received first place in the Best Editorial and Best Feature Story categories. Alec Barton won the Best News Series category. “A Half Bubble off Plumb” writer Randal Thatcher took first in Best Feature Column. Sports writer Bob Bahlmann won first for Best Sports Story. (Perhaps with these awards and as the sports season is wrapping up, it is an appropriate time for the Messenger—and its readers—to say “thanks, and fond farewell” to Bahlmann, as he will be soon leaving the newspaper and moving with his family to the St. George area). Reporter Megan Batterman won first place for Public Notice Reporting. In newspaper page design, Lloyd Call won first places for Best Sports Page and Best Lifestyle Page. Call also won for Best Use of Ad Color. The Best In-House Self Promotion was a collaborative effort between Call, Managing Editor Robert Stevens and ad hoc designer Sean Hales. The win was for a series of ads promoting a new Messenger website. 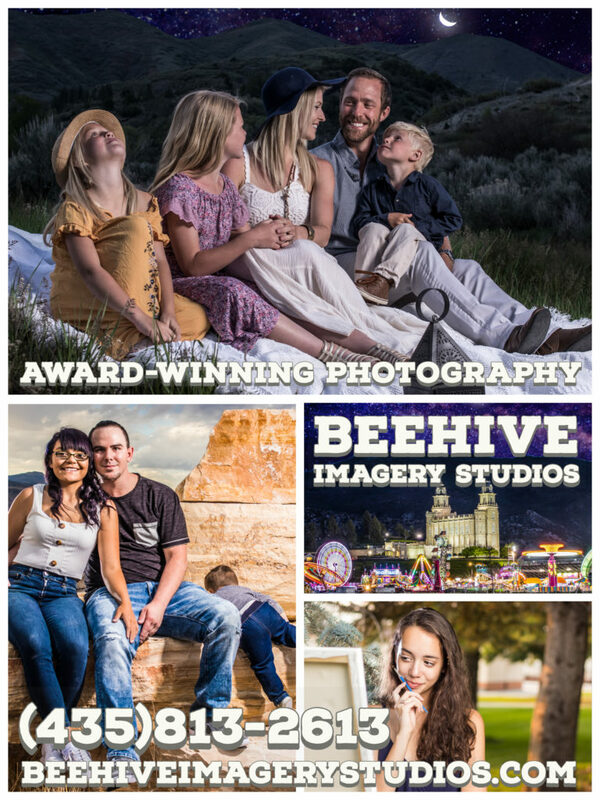 Managing Editor Robert Stevens took first place for Best Community Event, the Messenger’s “Most Beautiful Yards of Sanpete County” contest, which was the brainchild of Dean and Stevens. The entire Messenger team won first place for Best News Coverage. Second- and third-place wins were for Best General News Story, Best Digital Breaking-News Story, Best Sports Column, Best Photo Page, Best News Photograph, Best Feature Photograph, Best Staff-Produced Ad, Best Ad Idea and Best Website. Equestrian vaulter and North Sanpete High School freshman Shaylee Swapp practices an “equestrian vaulting” routine on one of the horses she uses for the half gymnastics, half horse-riding sport. 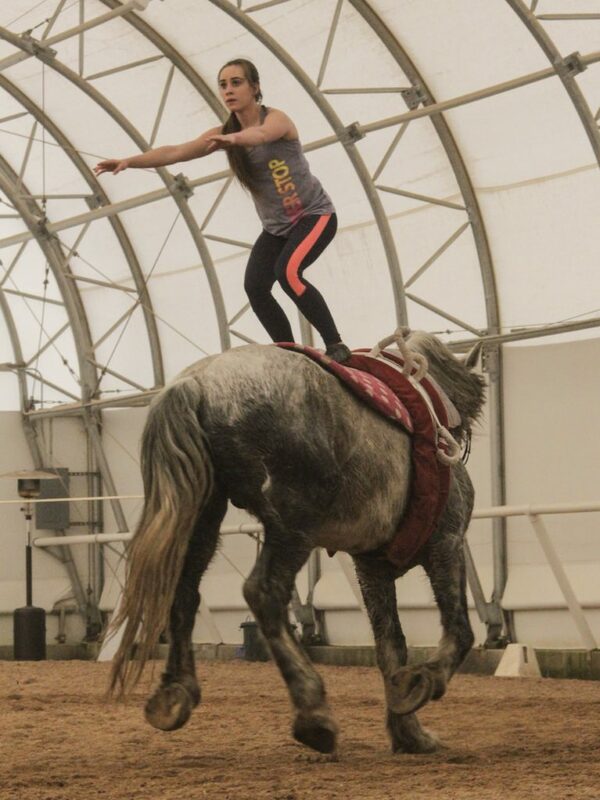 She says she would rather be on the back of a horse than almost anywhere else in the world.